Bexhill United Football Club remains within touching distance of the division’s top two following a good home victory on Saturday. Second half strikes by Drew Greenall and Sammy Bunn gave the Pirates a 2-1 win against a strong Littlehampton Town side in Southern Combination League Division One. 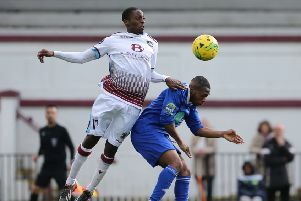 Rather like in Bexhill’s 1-0 defeat at home to leaders Alfold during January, Bexhill were a little bit on the back foot early on as the opposition started brightly. Bexhill had to adjust to Littlehampton’s system - something they’ve not been used to doing this season - and it took them 10-15 minutes to get a grip on the pace of the game. Having gone a bit long in the early stages, Bexhill shortened their game up and looked so much better for it as they started to get on top during the second quarter of the contest. Bexhill began to restrict Littlehampton somewhat to breakaways, although the visitors were quick in attack. Both teams showed good quality on a difficult surface at The Polegrove, but there were no real clearcut chances during a goalless first half. Although quite pleased with their first half display, Bexhill stepped up a gear in the second period. They quickly got on the front foot and pinned Littlehampton in. With the game becoming slightly more open, Jack McLean started to open the visitors up a bit more and Greenall had a couple of half-chances. Bexhill opened the scoring on 56 minutes. Jack Shonk did really well on the right, making his way to the byeline and pulling the ball back for Greenall to tuck home. With Bexhill centre-halves Craig McFarlane and Lewis McGuigan rising to the challenge of playing against a good front two, you sensed that one goal might be enough. But Bexhill gave themselves the comfort of a two-goal cushion following a 60th minute corner. A fantastic delivery from Jamie Bunn was half cleared as the ball spun up in the air, Sammy Bunn rose highest to head home with the goalkeeper slightly out of position. For the next 20 minutes Bexhill were really in control, keeping the ball really well and showing excellent game management. Littlehampton pulled one back, though, in slightly bizarre fashion. The pacy Jack Langford, who was impressive throughout, got on the end of a throughball and went down after contact with McFarlane as they entered the box. The ball rolled through to Bexhill goalkeeper Dan Rose, who then kicked it forward. It seemed as though a penalty wouldn’t be given, but the linesman belatedly flagged, the referee spoke to him and eventually the spot-kick was awarded. Mitchelly Hand duly tucked it away. The game was therefore on a knife-edge during the last 10 minutes and Littlehampton won a couple of corners, but Bexhill stood up to every challenge, kept winning the ball back and clinched a vital victory. Bexhill: Rose; Holden, McGuigan, McFarlane, Ottley; J. Bunn, Foster, S. Bunn (Robertson); Shonk, Greenall (Kalambayi), McLean (Gouet). Southern Combination League Division One top half standings (played-points): 1 Alfold 28-68 (+48 goal difference), 2 Steyning Town 28-67 (+43), 3 BEXHILL UNITED 28-65 (+62), 4 AFC Varndeanians 27-58 (+35), 5 Selsey 28-54 (+28), 6 Littlehampton Town 28-41 (+3), 7 Hailsham Town 29-39 (+6), 8 Sidlesham 29-37 (-12), 9 Seaford Town 28-36 (-6).